As the producer o f "The Silent Outcry: The Life and Times of Samuel Avital" I am proud to announce that the program is now complete and available nationwide. The program maybe purchased in any broadcast format, or in VHS and DVD for home viewing. The Silent Outcry is a portrait of one of the great mime masters in the world today. Samuel Avital has made an incredible journey, both spiritually and physically. The program traces this journey, from his upbringing in Morocco to his furtive flight to Israel. His time in Paris is highlighted, including his work with the French masters of mime, Etienne Decroux and Marcel Marceau. 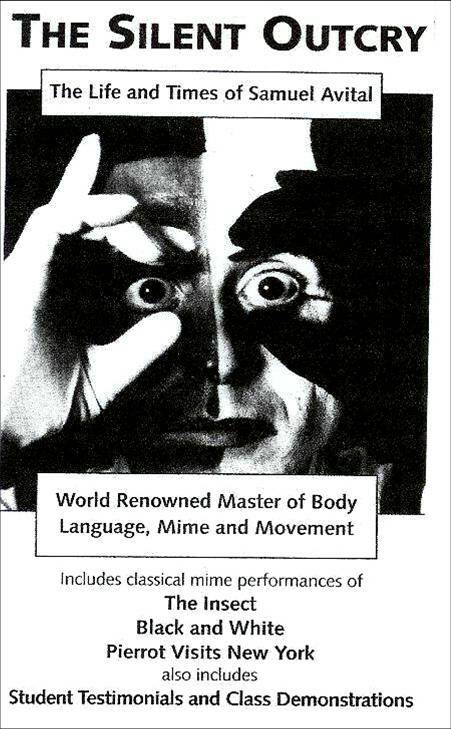 This program also contains the classic mime pieces The Insect, Pierrot Visits New York and Black and White. Avital's journey across America, from New York to Texas, and finally to Boulder, Colorado is also documented. Others are heard from as well. Students from around the world speak of Avital's influence as they participate in the Internationally renowned Summer Mime Workshops held every summer in Boulder, Colorado. "The Silent Outcry is a must for anyone who still believes in the individual artist in today's conformist world. Samuel talks from the heart in this program. His view of life seen through the eyes of a mime speaks volumes. He is funny, thought-provoking, and challenging - often all at once, I am very happy to have been associated with this endeavor." Paul J. Hansen, former CBS, PBS producer.